The photograph in your identification document must be recognisable as a likeness to you as you are on the day of the test. No other form of identification will be accepted. If you do not possess a current passport, a EU/EEA National Identity Card or driver’s licence you must obtain a certified letter of identification from your school or other educational institution. The letter must be on official letterhead and must contain your name; date of birth; a passport photo glued to the letter with institution stamp overlapping; signature and title of the official verifying the identification; and your signature. You are strongly advised to use this template to avoid any problems on the day. If you do not have one of these forms of identification, please allow enough time to organise one before the test date as you will not be able to enter the test centre without an approved form of identification. Some of these identification documents can take approximately a month to obtain. Digital formats of identification, student cards, Garda cards and/or documents that have expired will NOT be accepted under any circumstances. Photocopies of identity documents are also not acceptable forms of ID. Your date of birth, first and last name in your identification document must match your Admission Ticket details. 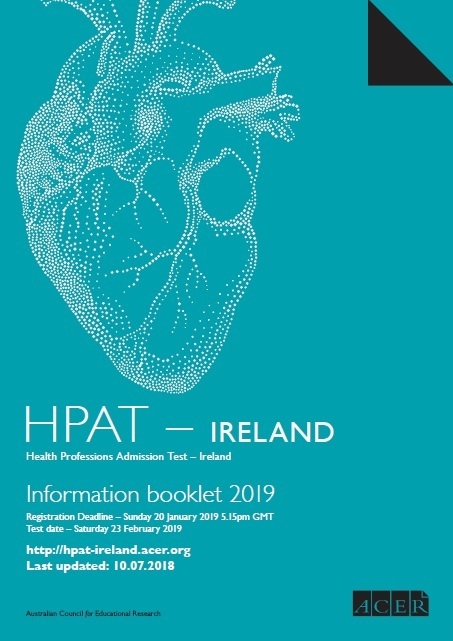 If you do not present one of the above identification documents, together with your printed Admission Ticket, you will NOT be able to sit the HPAT – Ireland test and your registration fee will be forfeited.